Bangalore-based startup Ideophone Technosol Pvt Ltd, which started four years ago and till recently was a mobile app developer for travel domain, pivoted few months ago to start its own website TripThirsty.com, a directory for adventure travel. 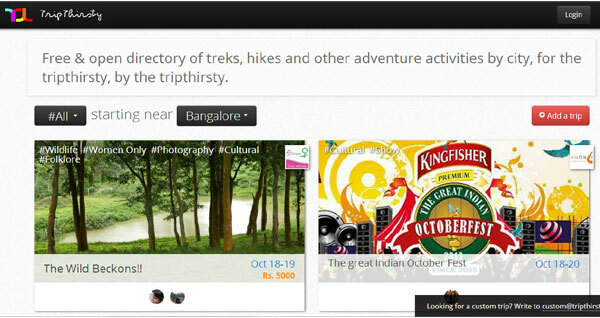 TripThirsty.com was founded in June this year by Kingsley Joseph, Sundar Lakshmanan, Anenth Guru and Sandeep Bhaskar. Joseph holds a Masters' degree in Information Systems from Indiana University in the US. Prior to starting TripThirsty, he worked at Salesforce.com, Digital Chocolate and Bank of NewYork Mellon in various roles. All the other three co-founders hold Masters' degree in IT from IIIT Bangalore. Lakshmanan earlier worked with Yahoo, Ziva and InMobi, while Guru was previously at Nokia's R&D centre. Their partner Bhaskar worked at Astonishing Tribe (TAT), prior to co-founding TripThirsty. "Today, if you wish to find an adventure trip somewhere, say Bangalore, the options are limited among several groups such as Meetup.com, Facebook and some other websites. You can spend all your time searching, but still cannot find all options such as wildlife photography workshops, reptile handling and women-only camping trips," said Joseph. "Ours is an open platform for adventure travel so anyone can list a trip on our site. We don't cherry-pick or curate our providers. Instead, we let their on-site ratings and reputations do the talking," he added. TripThirsty has over a dozen listings on its site and claims it adds 10-15 listings to its platform every week. It is now in talks with actual trip providers to offer a better integration so that the site shows the exact number of bookings it receives, etc. As of now, the company does not track the number of bookings. The listing on the platform is currently free and the firm wants to keep it so forever. However, it will introduce verified listing at some point in time. Currently, TripThirsty makes money through leads generation. "Often times, customers want a custom trip and contact us to help them find the right provider. So we are planning to add a payment gateway for providers who want to use us for bookings." The startup also explores the possibility of being the global distribution system for adventure travel, where it will become more like redBus and provide an API (application programming interface) with availability information that any travel agent can tap into. Joseph informed that TripThirsty already raised an undisclosed amount in funding from IIM Ahmedabad's business incubator CIIE and three individual investors, early this year. "We are using this capital to support our expansion plans, add sales staff, advertising & traffic growth and investments in technology to help integrate with organisers better. In the long term, we will look to expand to other Asian & Middle East markets," he said. TripThirsty faces a direct competition from Thrillophilia, another adventure travel portal that recently raised $200,000 in funding from a group of angel investors. "Thrillophilia is shifting its focus from corporate to consumer markets, whereas we're starting out with consumers first. Another difference is that it currently sells all experiences under the Thrillophilia brand, whereas we will be enabling our partners to build their own brands through us, and our credible third-party ratings," Joseph claimed. Other competitors are Tushky, Poshvine, Bangalore Mountaineering Club and Getoffurass.com. Online travel sector in India has been booming for the past few years, with emergence of many niche OTAs and travel search engines. This sector has also seen a lot of action in terms of early stage funding. As a sub-vertical, the adventure travel segment has witnessed traction and is poised for further growth, as the employed youth in India especially IT employees are frequently undertaking adventure trips/trekking/mountaineering in weekends. This offers massive opportunities for companies such as TripThirsty and Thrillophilia. There's always the threat of the larger OTAs expanding to capture a slice of the demand with their brand recall, but these niche sites are looking to build their own client base as a focused outlet for this segment. While the demand is there, whether they will be able to carve a niche while scaling up is yet to be seen.